There seems to be a resurgence of interest in reissuing Rosemary Sutcliff's novels - and not before time, either! in paperback with very striking covers and high quality print and paper. Sadly the illustrations from the original OUP editions aren't included. And what about her old publishers, the Oxford University Press, here in Blighty? Well, they're doing their bit too. has never (I believe) been out of print since it was first published in 1954 and the most recent edition came out in 2004, marking 50 years since it was first published. New editions of the other two novels in the trilogy, The Silver Branch and The Lantern Bearers, were reissued in 2007, so that all three classic novels are now available in a uniform edition. and (according to amazon.co.uk, though it isn't mentioned on the OUP website yet) Warrior Scarlet in August 2008. I should love to see new editions of Song for a Dark Queen, The Capricorn Bracelet, Dawn Wind, Knight's Fee, Blood Feud, The Shining Company, Sun Horse, Moon Horse...and, oh, all of her other wonderful novels made available for a new generation of readers. But this is a very promising and welcome start to be going on with! I grew up in a house on the edge of a cliff, looking out over a bay. There was an upstairs drawing-room which was never used, and in the evenings when I was a little girl, I would go up there and close the door. Kneeling on the window-seat, I would gaze out at the sunset over the sea and the clouds banking on the horizon, and escape into my imagination. In those clouds I saw horses and chariots, marching legions, the thronged streets of medieval towns, knights in armour, great ships in full sail on a golden sea – vivid images from the books my father read me. The worlds they conjured up were consoling and utterly real to me, and I lived in them more than I lived in the present. 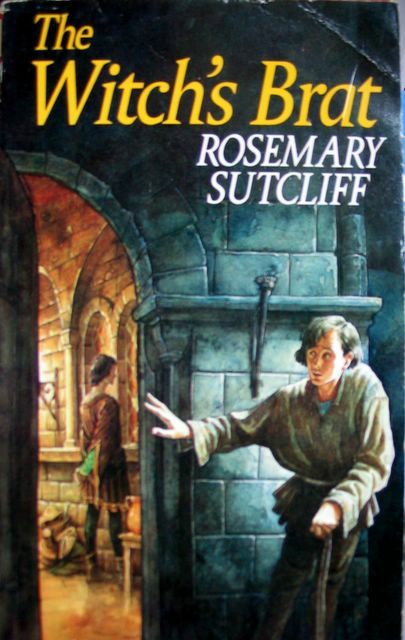 Rosemary Sutcliff was the creator of some of those worlds, and years after I first encountered her through her early books The Eagle of the Ninth and The Armourer’s House, I came to know her again – insofar as one can know such a complex person – through her memoir Blue Remembered Hills. It was first published in 1983 and the cover shows its author sitting in a wheelchair in a garden, looking straight out. It is in some ways a startling picture for a book jacket, for her body, hands and arms are twisted by the infantile arthritis, known as Still’s Disease, that burned its way through her as a child, leaving her permanently disabled. But what to me is most arresting about the photograph is her direct and humorous gaze. It sums up the spirit of Blue Remembered Hills which, despite the inevitable pain it often records, is the very opposite of a misery memoir. It is a record of the growing up and making of a writer, and it is full of poetry, humour, affection, joy in people and the natural world, and the kind of deep understanding that can come out of some very hard experiences. It is a book I would recommend to any apprentice writer as an example of what really good writing is. Rosemary Sutcliff was born in 1920, the only child of a naval father – a dear, straightforward man who ‘you could never for a moment have mistaken for anything but a sailor. He had a quiet steady face with a cleft chin, and grey-blue eyes crinkled up by years of narrowing them against rain and wind’ – and a pretty, manic-depressive mother with bags of charm and a wild imagination, who in an ideal world would probably have become an actress but instead found herself travelling from naval station to naval station – Malta, Chatham, Sheerness. And although she loved dancing and parties, she missed out on the social life that went with being a naval wife because she was caring for a sick and increasingly disabled child. Even so, in some ways Rosemary’s was an enchanted childhood, lived among the vivid sights and sounds of the dockyards, ‘the smell of pitch and hot metal, wood and white paint, salt water and rope and oily smoke’ which would later feed into her books. There were the people, too, of these small closed communities – adults on whom Rosemary, as an only child who couldn’t walk very well, was particularly dependent, though she did make friends of her own. In this unpromising setting Miss Beck’s students made cross-stitch kettle holders, drew elaborate kaleidoscopic patterns on graph paper and learned to read from a tattered copy of Grimm’s Fairy Tales. When Rosemary joined Miss Beck’s Academy at the age of 7 or 8 she was still unable to read, but by the end of her first term, ‘without any apparent transition period’, she was reading anything that came her way. A lesson there perhaps? Certainly the description of the relaxed and happy days given over to singing around Miss Beck’s piano, declaiming verses from Macaulay’s Lays of Ancient Rome, and observing what Miss Beck called ‘the Beauties of Nature’ make one think rather sadly of the world of SATs and League Tables in which children live today. Sometimes Rosemary’s father was away on foreign postings, and then she and her mother were relegated to digs in places like Westgate, on the bleak north Kentish coast, or to the mercies of Uncle Acton, the good-hearted bad penny of the family, who had spent a brief working life building roads in India, was fat, funny and fond of the bottle, and given to renderings of the ‘Waikiki War Chant’ and ‘Bye Bye Blackbird’ on the Hawaiian guitar. Interspersed with these were Rosemary’s frequent stays in hospital. They were lonely, often painful experiences, but even at this early stage in her life Rosemary could observe and admire the skill of her surgeon, kindly Mr Openshaw, who could cut off a plaster cast from hip to toe in one unceasing movement without leaving a single mark on her body. And of Mr Snow the instrument maker, much loved by the children, who would go to any lengths to make sure that his small patients were comfortable when he fitted them with callipers and splints. There were other magical times too – especially those when she and her father sat down together to look at the albums of his travels, their brown hessian covers ‘folded back with a heart-leap of expectancy’ to reveal fading photographs – of ships and ‘grinning faces in balaclava helmets, with icebergs in the background . . . Pompeii, with the wheel ruts of chariots deeply shadowed by the afternoon sun on a paved street . . . the Lyon Gate at Mycenae in the days when you could pick up shards of Mycenaean pottery as easily as anemones from the rough grass’. The writer in her was storing it all up, just as she was storing up the feel of the marsh country round Sheerness, and of the South Downs, where the family sometimes went to visit her grim Aunt Lucy. When her father retired from the sea the family moved to Torrington in North Devon, where her father had been born and bred and where they had always taken their holidays. They bought a house called Netherne, perched on its own on high ground on the edge of Dartmoor, and – country people at heart as they had always been – it felt like heaven. They had hens, and vegetables, and an Airedale puppy called Mike, and her father wrote Sailing Directions for the Admiralty in ‘a sort of cabin’ in the garden (a perpetual job as they almost immediately went out of date). Rosemary loved her small bedroom with a view of the crown of a big lilac tree on one side and ‘Orion hanging in at the Dartmoor window’ on the other. She loved the sounds of the curlews coming in from the coast, the owls that ‘perched on the chimney to warm their feet and made eerie noises down to us’, and the magical moment of cockcrow in the first green light of morning, ‘a sound with a bloom on it, like dew, and shaped like a fleur-de-lys’. The nearby school, however, was not a success. Rosemary left at 14 and went to Bideford Art School, where she was the baby of the class, treated kindly by the other students, but definitely not part of their social world – though in time she became extremely skilled as a miniaturist, whose work would even one day cause a stir at the Royal Academy. Deep loneliness was beginning to set in, her mother was becoming increasingly depressed and difficult to live with, and neither of her parents could see that Rosemary, at 16 and 17, was in desperate need of company of her own age. So of course she fell in love with any young man who paid her the slightest attention – first with her cousin Edward, a bittersweet experience that ended with the declaration of war in 1939, when Edward, who was in the Navy, went off to join his ship. Fortunately for us, however, she had just begun to discover writing and before long her first book for children, The Queen Elizabeth Story – ‘written out of heartache, but also out of something set free within myself’ by that searing experience – was accepted by the Oxford University Press. There she ends her story and the rest, you might truly say, is history. It is a wonderful memoir, and one feels braver somehow, more alive, more philosophical for reading it. Because it is written out of the truth of the heart, it is timeless – the kind of book one can return to and find the same golden qualities again and again. Rosemary Sutcliff’s Blue Remembered Hills (1983) is now available from Slightly Foxed in a new limited and numbered cloth-bound pocket edition of 2,000 copies, each priced at £10 (plus post and packing). Copies may be ordered by post (67 Dickinson Court, 15 Brewhouse Yard, London EC1V 4JX), by phone (0207 549 2121) or via our website http://www.foxedquarterly.com/. SLIGHTLY FOXED EDITIONS No. 1. Rosemary Sutcliff is one of the most distinguished children’s writers of our time withover forty historical novels to her name. Blue Remembered Hills is the vivid and touching memoir of her childhood. (see p.13 SF No. 17; also SF No.4). Rosemary Sutcliff was born in 1920, the only child of a naval father and a pretty, manic-depressive mother with bags of charm and a wild imagination. She suffered from infantile arthritis, known as Still’s Disease, that burned its way through her as a child, leaving her permanently disabled, but this is the very opposite of a misery memoir. It is a record of the growing up and making of a writer, and it is full of poetry, humour, affection, joy in people and the natural world, and the kind of deep understanding that can come out of hard experiences. Despite moving regularly between naval digs and frequent, lonely stays in hospital, Rosemary’s childhood was, in some ways, enchanted, lived among the vivid sights and sounds of the dockyards, which would later feed into her books. When her father retired from the sea the family moved to Torrington in North Devon - it felt like heaven. However, the nearby school was not a success. Rosemary left at 14 and went to Bideford Art School, where she became a skilled miniaturist, eventually exhibiting at the Royal Academy. In time, feeling cramped by the small canvas of her paintings, isolated in the country and hurt in love she turned to writing and there found success and fulfilment. Blue Remembered Hills is a wonderful, timeless memoir critically acclaimed and much loved since its first publication in 1983. Rosemary Sutcliff’s Blue Remembered Hills (1983) is now available from Slightly Foxed in a new limited and numbered cloth-bound pocket edition of 2,000 copies, each priced at £10 (plus post and packing). Copies may be ordered by post (67 Dickinson Court, 15 Brewhouse Yard, London EC1V 4JX), by phone (0207 549 2121) or via the website http://www.foxedquarterly.com/. Sword at Sunset will be reissued in May 2008 as a paperback by Chicago Review Press. Listed on Amazon the price will be around £7.00 or $15.00. A foreword has been written by Jack Whyte, who himself is an author of a series of novels exploring the Arthurian myths. Another of Blyton's traits I dislike is her laziness. I don't believe she ever researched anything - unlike her contemporary Rosemary Sutcliff, whose posthumously published Dark Ages saga Sword Song (Bodley Head, Pounds 12.99, ISBN 0 370 323 94 7) is packed with precisely described Viking sea battles and sacrifices in a linguistic smorgasbord of thongs, thralls and fiery-bearded men. I was never a Sutcliff fan as a child, tiring too quickly of the sun glinting off the halberds of people with names that sound like Haggis Bogtrotterson, but the opening of Sword Song is a stunner: a 16-year-old boy is exiled from his settlement for the manslaughter of a monk who had kicked his dog. Beat that, Melvin Burgess. Regrettably, the story quavers thereafter, meandering around the coast of Britain as young Bjarni sells his fighting skills to one fiery-beardy after another, but the dense historical detail and rich colours are all still there. The Shield Ring by Rosemary Sutcliff (Puffin, Pounds 3.99): This story of how the Norse settlers of Butharsmere held out against the Norman invaders is one of Sutcliff's most engrossing novels. It has been too long out of print and this edition should be the cause of much rejoicing. Y GODODDIN is not a species of baby-talk, but a tale of bloody strife, said to have been written around the end of the 7th century by the Welsh bard Aneirin. It tells how the High Chief of the Gododdin, Mynyddog Mwynfawr, called a hosting of the Celtic tribes at Edinburgh. There, for the space of a year, he trained a war-band of 300 princes and then unleashed them on the invading Saxons at the Battle of Catterick. Everything went wrong, and only one hero returned from the fray. But his exploits and those of his companions were celebrated by Aneirin in ``the Great Song that others will sing for a thousand years". This Great Song is at the heart of Rosemary Sutcliff's Shining Company, thus bringing Aneirin longer life than he expected. For as he gave elegiac voice to the deeds of hero after hero, so she has taken the names from his telling and has sought to imagine them back int historical reality. Speaking through the persona of Prosper, the son of a Welsh chieftain, and eventually shieldbearer to the knight who returned, she begins by establishing a sense of the closed tribal world of the time after the Romans, and then introduces unbardic perceptions of form and motive. Personal relationships and the countryside of the Dark Ages become vital ingredients in the renewed story, and as the episodes pile up the ride to Edinburgh, the welding of disparate forces into a single fighting group so the reader is made ready for the great setpiece of the battle and the long dying fall of its tragic aftermath. Such a theme is natural to Sutcliff's art. She is moved by simple concepts of loyalty and integrity that may be as foreign to today's children's literature as they were to the no-baby-talk Gododdin. But by admitting their possibility, while not shirking the real facts of ferocious woundings and pragmatic betrayals, she still persuades us that a bardic reading of the past is sustainable alongside an awareness of its squalor and its indifferent, but unpolluted, landscapes. BRITAIN has never had its own Ben Hur. However, hot on the heels of the success of Gladiator, this may change. Duncan Kenworthy (the co-producer of comedy films such as Four Weddings and a Funeral and Notting Hill) has just bought an option on Rosemary Sutcliff's classic children's book The Eagle of the Ninth. 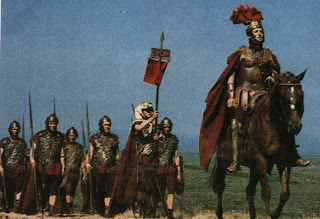 Based on the true story of the lost Ninth Hispana Legion, which disappeared somewhere north of Hadrian's Wall in the second century AD, it is a romping tale about a young legionary, Marcus, who ventures into Scotland to look for the missing soldiers, including his father, and their standard. It is an odd project for Kenworthy but it will be good to see the Romans in Britain for once. Let's just pray that the producer does not want to cast Hugh Grant as Marcus . . . THE PROBLEM with the past is that it just won't stay put: it's always shifting to accommodate our needs, our assumptions about the sorts of people we are. 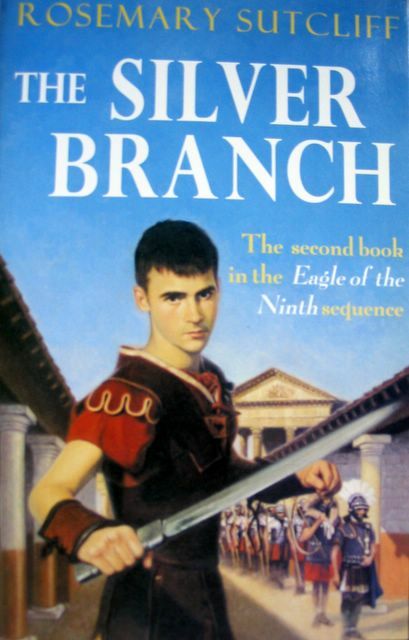 Not long ago, I re-read Rosemary Sutcliff's children's story, The Silver Branch, which is set in Britain towards the end of Roman rule. When I first read it, 25 years ago, I took it as a fairly faithful recreation of the period; second time around, what was striking was how obviously it was the product of the time it was written, the 1950s. The story has two young Romano- British patriots on a spying mission in Saxon-occupied Britain - sleeping in haylofts, evading the brutal Germanic invaders with the help of friendly locals: it's basically a Second World War resistance yarn transposed to the fourth century. By contrast, Sunday's opening episode of A History of Britain by Simon Schama (BBC2) presented a much gentler picture of the same period. Schama disdained talk of "apocalypse" in favour of gentle change - Roman Britannia "morphed" into the Anglo-Saxon kingdoms; the process was "an adaptation, not an annihilation". Partly, no doubt, the differences between Sutcliff's picture and Schama's reflect advances in understanding. But Schama's version also said something about the way we live now: this was history for a multicultural society, one that embraces difference and defines its relationships with the outside world in terms of trade and economics, not wars and empires. Schama depicted the Roman occupation of Britain in similarly benign terms - the odd violent episode aside, it was a matter of seduction rather than conquest. Hadrian's Wall was depicted as a conduit for trade, not a military frontier. But which of Sutcliff's books would you like to see on the big screen? On exploring Google Book Search, I found a Rosemary Sutcliff short story. It's called Flowering Dagger and is in a collection called Within the Hollow Hills: an anthology of new Celtic writing, edited by John Matthews, published 2000 by Steiner Books. A few sample pages can be found here. It was originally published in The Real Thing, edited by Peggy Woodford, Bodley Head, 1977. Other contributors include: Robin Williamson, R.J. Stewart, Caitlin Matthews, David Spangler, Peter Vansittart, Henry Treece and Margaret Elphinstone, plus others. Other books by or mentioning Sutcliff extracted on Google Book Search include: The Wanderings of Odysseus: The Story of "The Odyssey", Essential Fiction Genres Student Book by Peter Ellison, 100 More Popular Young Adult Authors: Biographical Sketches and Bibliographies by Bernard A. Drew, Honey for a Child's Heart: The Imaginative Use of Books in Family Life by Gladys M. Hunt, Killing the Celt by Tomas Runmhar, Black Ships Before Troy: the story of the Iliad, etc. If you want to search this blog specifically (to see if we've covered something) there is now a way to do this properly. In the bar on the right of the screen there is a Technorati search box. Just type in what you're looking for, and it'll bring back the results.